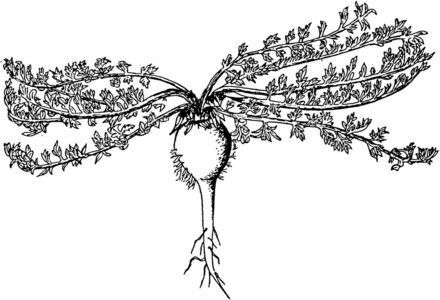 Maca (Lepidium meyenii) is largely unknown crop found at higher altitudes than perhaps any other crop in the world - at the altitudes up to 4.300 metres in the northern Peruvian Puna near Lake Junin. The area where maca (pronounced mah-kah) is grown is and environment of intense sunlight, violent winds, and bone-chilling cold. This area is among the world's worst farmland, especially in its upper limits, with vast stretches of barren, rocky terrain. Daily temperature fluctuations are so great that at sunset temperatures often plummet from balmy 18 C to 10 C below freezing. Fierce winds evaporate more moisture that does the fierce sunlight, and carry away more soil than does the rain. Even Potato could not do it! Actually, according to wikipedia, potato and many other closely related potato cultivated potato species were 'born' in the region of the Andes. Potatoes were first introduced outside the Andes region four centuries ago, and have become an integral part of much of the world's cuisine as we know it today. In areas where not even potatoes could grow, maca makes agriculture possible. Its roots resemble those of its relative the radish, and are yellow, purple, or yellow with purple bands. They are rich in sugars, starches, protein, and essential minerals - particularly iron and iodine. To Andean Indians, maca is a valuable commodity. Dried, the roots can be stored for years - maca powder. The sweet, spicy, dried root is considered a delicacy. Maca boiled in water is supposed to be sweeter than cocoa. However, from my personal experience I can not agree with the cocoa taste. To camouflague the bitter taste, I usually mix maca powder with my favourite morning fruit shake. Also, apple juice (best if fresh) is a really good for mixing maca powder. It is important in the diet, as it has one of the highest nutritional values of any food crop grown in the areas of Puna. The dried roots are approximately 12-16% protein, and are rich in essential amino acids. The fresh roots contain unusually high amounts of iron and iodine, two nutrients that are often deficient in the highland diet. If you have heard of maca before, than you know that its popularity comes from the fact that it is considered as best natural viagra supplement. It enhances fertility in both humans and livestock. Soon after the Conquest, the Spanish found that their livestock were reproducing poorly in the highlands, and Indians recommended maca. The results were so remarkable that they were noted by surprised Spanish chronicles. Colonial records of some 200 years ago indicate that tribute payments of roughly 9 tons of maca were demanded from the Junin area alone. Maca has been famous for its medicinal advantages, often we can find in the literature that it was eaten by Inca imperial warriors as a preparations before battles. The fresh roots are baked or roasted in ashes. The dired roots are mainly boiled in milk or water to create a savory, fragrant porridge. It also make a popular sweet, fragrant, fermented drink (maca chicha) that is often mixed with hard liquor to make 'coctel de maca'. It is the dried roots that are most used. After being dried at the sun, they become brown, soft, and sweet, with a musky flavour. It is reported that the flavour remains strong for two or even more years. One of the best natural ways to regulate and support endocrine health. Maca as food supplement comes in a few different forms: powder, extracts and formulations, capsules and tablets, smoothies and others. However, my favourite is certainly Raw Organic Maca Powder. First, it is the cheapest. Second, I can blend it to my morning fruit shakes. If you have never tried Maca before, I suggest to start with a smaller dosage of 1/4 of teaspoon twice a day (at breakfast and dinner) and after a while you will see yourself if you need to increase dosage. We are all different and each of us must find their own dose which is best for him. If you have a simptoms that you would like to cure with maca, maybe you should increase your daily dosage. In any case total daily amount taken should not exceed three teaspoons. I am taking 1/2 teaspoon of Maca Powder every morning. I don't take it at the evenings. If I do, I have trouble sleeping, because to me it is a sort of energy boost. This is why I like it in the morning. Personally, I didn't have any negative side effects while taking Maca, however if any kind of negative effects are shown, you should immediately decrease your daily dosage and probably consult with your doctor. If you ask me, almost every side effect has something to do with to high daily dosage or a bad combination with other drugs. Again, if you would like to experience all the benefits of Maca Powder, you should slowly start introducing it to your body. Start with smaller daily dosage (app. 1/4 teaspoon twice a day). Maybe you will have trouble sleeping, so stop taking it at the evenings as I did. If you will start feeling comfortable taking Maca as your daily nutritional supplement, than you can increase daily dosage. 1) Lost crops of the Incas, 1989. National Academy Press, Washington DC. Have A Great Experience/Story About This Topic? Did you have a great experience with this topic? Would you like to share an interesting story/research?